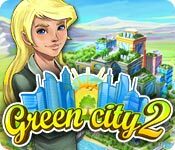 It’s time to go green again in Green City 2! Help your neighboring cities start their own green life by restoring old buildings and cleaning the streets of trash. Build eco-houses with solar cells on the roofs, open new green energy plants and teach citizens the eco urban lifestyle of Green City. 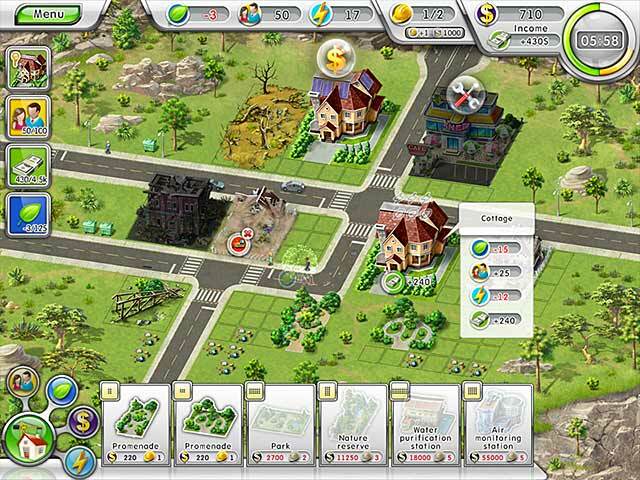 Strive to achieve ecological balance in this thrilling strategy game! Green City 2 is rated 4.4 out of 5 by 27. Rated 5 out of 5 by melanyj02 from Challenging albeit frustrating strategy-builder I wouldn't say that this is a hyper-fun game because it can be sooo frustrating! Nevertheless, its' value for money surpasses many other BFG releases. As usual, I'll list out the PROs and CONs. Pros - Challenge factor - Duration (54 levels that start becoming 'hair-pullingly' annoying in the early teens) - Humbling (if you think you're good at builder style games, think again) - Value for money Cons - Challenge factor can lead to intermittent bouts of yelling incomprehensible strings of words at the screen (NOTE: game is NOT voice controlled) - Higher levels sometimes seem irrational (tearing down of a perfectly good building in order to build another in its' place is often required) Overall Challenging. VFM. Duration. You definately get a feeling of satisfaction once a level has been successfully completed, even if it has taken 3 days to get there. In my books that equals a great BFG game. Rated 5 out of 5 by Justy1002 from Love this game Not much different than Green City 1, but just as fun. It has the challenge I love and I recommend it to anyone looking for a strategic builder game that needs to beat the clock for gold. Rated 5 out of 5 by mary102696 from Better than the first and that was excellent I loved the first Green City and was shocked to see this one so soon. It is absolutely better. The first one was challenging to me and I had to replay levels to get the gold later on in the game. The second one is even more hair pulling and I absolutely love it. 5 star a-rated time management strategy game. A helpful hint while playing is that you have to be more cut throat/sharky in this second edition than the first. Rated 5 out of 5 by phillipsjennie from Great Fun! I am enjoying this game very much! It's fun, and challenging, without being so hard I get frustrated and give up. This one is even better than Green City (the original). Rated 5 out of 5 by shevadz from Solid fun I like such strategies very much and the 2-nd part of Green City seems to me much better in two points: levels and storyline became more interesting, bugs were fixed. For me its enough to give for my friends advice to play Green City 2. Rated 4 out of 5 by MermaidWishes from A Repeat... I have Green City...Green City 2 is EXACTLY like it. In my opinion, if you own the first one, don't waste your money buying this one. I love Green City, but do not need 2 games that are the same. If you don't have the first one, then buy this one while it's on sale. Rated 4 out of 5 by jat3435 from Great TM Game I found this game very challenging. Love it. Rated 4 out of 5 by pinmom from A step above the first Green City I am enjoying this and did buy it after the trial. The first few levels are not overly challenging. More a meet and greet kinda thing to learn what affects buildings, and how that works with the green spaces, etc. I am not to worried with how many stars I get right now, just learning the dynamics of the game. later, I will play again and see how well I can do getting 3 stars on a level.I can not think of what level it was, but one did vex me something awful and took five tries to get right! I like to think I learned from that rascal! All in all, not a bad game and a fun way to challenge yourself so give it a go! 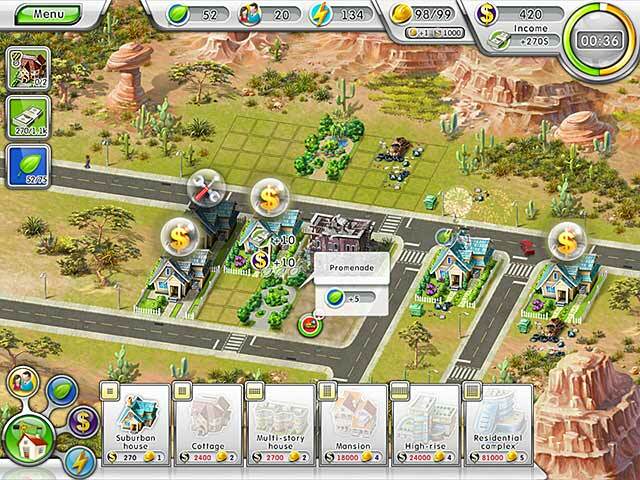 Rated 4 out of 5 by kim0530 from Eco Friendly If you have Green City 1 and love it then you will love Green City 2. It's the continuation from one in regards of building another city. The graphics are more detailed and geographic setting is different. As for the game plan, it basically the same as in Green City 1. Rated 4 out of 5 by pennmom36 from Build your own eco friendly city! 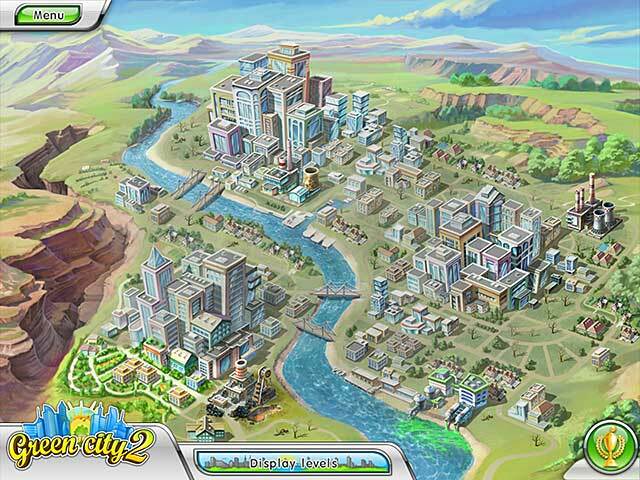 Green City 2 is a fun game to play but, in my opinion there isn't enough to do and I like a faster paced TM game. With that being said, the Mayor of the successful Green City has been asked by a little girl to rebuild her city as well and of course, off we go to destroy the evil coal plant that is making our water unsafe to drink and our air unsafe to breathe (why not make the coal plant eco friendly?) Anyway you are given a task at the left of the screen to build so many cottages, houses, gardens and also to keep the green value at a certain level. You must destroy abandoned buildings, and learn which houses to sell for money to build the necessary buildings for your task. There is a wheel in the bottom left of the screen to easily choose what category to pull up which makes it easier and faster to navigate. There are a lot of achievements to earn and you will have fun playing this game. Enjoy! Rated 4 out of 5 by moonryu from Overall a fun Time Management Game Very nice graphics and game interface. This time management game can be challenging at the earlier levels until one figures out the right order to build, upgrade and destroy. My only issue (and it might just be that I could not easily find it), is at what level of completion you are time wise (1 star / 2 stars and 3 stars). Rated 4 out of 5 by neilskinut from sequel and fun Time to build your new city with a garden and other things. Fun game that is timed. I did not play the first game so to me the directions could have been better. No voice over so there is lots of reading. The graphics are good and so is the music. If you do not like your time you can play the part over again. If your looking for a HO game this is not it. Pretty fun building and getting points. Kids would love to play also. Rated 3 out of 5 by SockTrollQueen from Kind of Blah. The sound and graphics were slightly better than its predecessor. Story-line I can take or leave. Basically you plop down a house, collect funds, improve it by making it more Eco-friendly. It would be cooler if you actually could choose the types of upgrades. It is repetitive and I got bored rather quickly. I'm not buying it. Rated 2 out of 5 by MusicNat from Not my cup of tea I love time management games and truly wanted to give this one a chance. Unfortunately I found this game boring and tedious. I know it is a matter of personal taste but it just was not for me. The story-line was lacking, music was grating, and the graphics were uninspired. The tutorial did not give one a chance to figure out what needs to be done before the timer started going off causing me to fail from the get go. I never played the first edition of this game so that may be a part of it. The one thing that I liked about this game is the theme. The title caught my attention. I love the whole concept of going "green" so I was surprised that I did not love it. I think with some tweaks to the things mentioned above it has potential. It's time to go green again! Take a new eco-challenge and turn ecological ruins into flourishing green life!